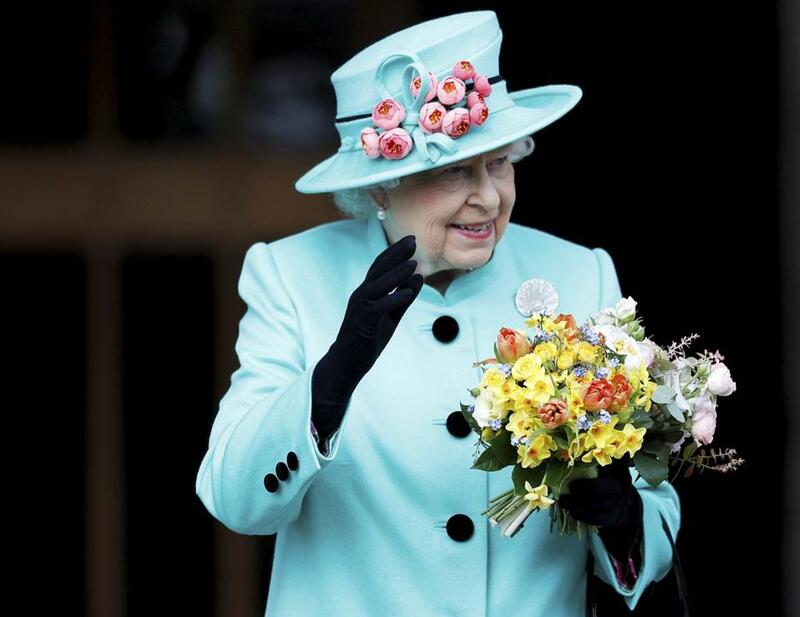 Britain’s Queen Elizabeth II left Easter Sunday service in Windsor Castle last weekend. LONDON (AP) — Britain is marking Queen Elizabeth II’s 91st birthday with gun salutes, as the monarch celebrates quietly at home. A troop of the Royal Horse Artillery will ride horse-and-gun carriages past Buckingham Palace before staging a 41-gun salute in Hyde Park at noon (1100GMT). There will also be a 62-gun salute at the Tower of London an hour later. The queen is Britain’s oldest and longest-reigning monarch, having become queen on Feb. 8, 1952. She is also the world’s longest-reigning living monarch since the death of Thailand’s King Bhumibol Adulyadej last year. The queen usually spends her birthday privately. She also has an official birthday, marked in June — when the weather is better — with the ‘‘Trooping the Color’’ military parade. — Elizabeth has reigned for 65 years and 75 days. On September 9, 2015, she became Britain’s longest-reigning monarch, passing her great-great-grandmother Queen Victoria. — She is the world’s longest-reigning living monarch since the death of Thailand’s King Bhumibol Adulyadej last year. — She has had 13 British prime ministers serve during her reign, from Winston Churchill to Theresa May. — She has met 12 U.S. presidents, from Herbert Hoover (after he left office) to Barack Obama, more than a quarter of all the U.S. presidents since Independence. She is due to host President Donald Trump for a state visit later this year. — She has traveled more than 1 million miles (1.6 million kilometers) on official trips, visiting 106 countries. — She has visited Canada 22 times —the largest number of trips to any nation. — She has four children, eight grandchildren and five great-grandchildren. — She has cut back on her official duties in the last few years, but Elizabeth still conducted 332 official engagements in 2016. WHY TWO BIRTHDAYS A YEAR? ISN’T ONE ENOUGH? It may seem excessive, but the British monarch celebrates his or her birthday twice a year, once on the actual day (for Elizabeth, April 21), and once in early June, when the event can be marked with the gala Trooping the Color parade in central London. The June date is chosen in part because the famously fickle British weather just might produce a few sunny hours at that time of year. And the Buckingham Gardens are gloriously in bloom. HOW DID ELIZABETH WEATHER WORLD WAR II? Elizabeth was a young princess during World War II, and her father King George VI was concerned for her safety as London came under the repeated German bombing raids known as The Blitz. She and her sister Princess Margaret were moved to Windsor Castle, 25 miles (40 kilometers) west of London for security reasons. She later persuaded her parents to let her serve in the Auxiliary Transport Service, where she learned how to drive and repair ambulances and trucks as part of the war effort. She was assigned number 230873 while in the service. WHEN DID SHE BECOME QUEEN? Elizabeth’s life was changed forever in 1936 when her uncle, King Edward VIII, abdicated so he could marry his divorced lover Wallis Simpson. This made her father the king and Elizabeth heir to the throne. King George VI’s health failed, however, and he was too ill for a planned tour of the Commonwealth in 1952, so he sent Elizabeth and her husband, Prince Philip, in his place. They were staying in a remote part of Kenya on Feb. 6, 1952, when she was told that the king had died. She automatically became queen upon her father’s death, although the official coronation did not take place for more than a year. HAS THE QUEEN EVER COMPLAINED IN PUBLIC? No, that’s just not done. The closest Elizabeth has come to exhibiting human frailty to her subjects was in 1992, when she made a rare admission that her life, so picture perfect on the outside, was marred by the marital woes of three of her four children. She didn’t complain in English, however, looking to Latin to proclaim it had been something of an ‘‘annus horribilus’’ — a horrible year that included a disastrous fire at her beloved Windsor Castle. WHAT WAS THE LOW POINT OF HER MONARCHY? This would undoubtedly be the stormy days that followed Princess Diana’s sudden death in a car crash in September, 1997. The princess was tremendously popular, and many held the royal family responsible for her unpleasant divorce from Prince Charles. The queen was castigated in the press for not returning to London immediately after Diana’s death and for not flying the royal standard atop the palace at half-staff as a sign of respect. Thousands of mourners placed flowers at the gates of Kensington Palace, Diana’s residence, and many complained the queen was insensitive and out of touch. WHO WAS HER FAVORITE PRIME MINISTER? You’d have to ask her. And she won’t tell. DOES THE QUEEN PLAN TO RETIRE? The strong-willed and able-bodied queen has given no indication she plans to leave the throne, and has described her unique position as a ‘‘job for life.’’ Her own mother lived to be 101, and was generally in fine fettle in her final years. Still, it is possible Elizabeth would step down if she developed severe problems that made it impossible for her to carry out her role. PRINCE CHARLES IS GETTING UP THERE IN AGE. COULD THE QUEEN ARRANGE THINGS SO GRANDSON PRINCE WILLIAM WOULD SUCCEED HER? No. This is a constitutional monarchy, with rules of succession.